First: Do not blow up any part of New Mexico without express permission. Second: By "this" I don't mean this post, although if you have started your research here that is fine, if somewhat disturbing. 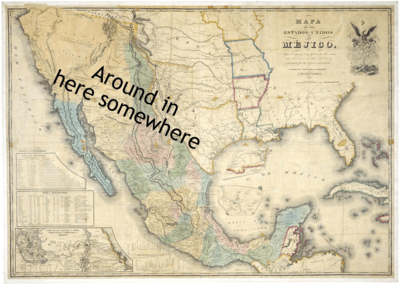 By "this," of course, I mean the Treaty of Guadalupe Hidalgo. As I understand the issue, because Article VIII of the treaty preserved existing property rights (of individuals, not of Mexico; see above), land disputes in New Mexico often involve Mexican law and the history of various land grants, as well as some sort of interpretation of the treaty provisions. And having glanced at just a couple of the cases involving these issues, there is absolutely no way I am going to get into any more detail than that. The point here is simply that if you want to make a deal that involves blowing up part of this area for any reason, like let's say you're making a movie about Afghanistan and realize that New Mexico is a lot closer, everybody involved needs to read the Treaty of Guadalupe Hidalgo, or, much more likely, hire a lawyer to do that. According to the Hollywood Reporter's law blog, for example, this is a major issue in a dispute between local landowners and the producers of the movie Lone Survivor, in which (I am told) American forces use a lot of explosives on the area immediately surrounding Mark Wahlberg. The upshot is that if making these kinds of arrangements, i.e., those that involve dropping bombs or mortar shells on someone's property, you want to be sure you are dealing with the right person or persons. Seems like a good rule of thumb in general, actually. Have You Been Offered a Tortoise in Unusual Circumstances? Carreon v. The Oatmeal: Legal Ethics, or Lack Thereof?